Temperature measurements are vitally important for addressing questions of radiative balance involved in climate change. Upper tropospheric temperature is particularly important to climate feedbacks involving the regulation of humidity and clouds. Some models show temperature in the mesosphere to be particularly sensitive to climate change. Temperatures required for the formation of polar stratospheric clouds (PSCs) are at the extreme low end of those found in the northern polar winter. PSCs play multiple roles in the catalytic destruction of ozone, and here MLS mission objectives of understanding stratospheric ozone layer stability and climate change are linked through temperature. MLS measures temperature primarily from thermal emission by oxygen, which is well mixed with a known atmospheric mixing ratio. The standard product for temperature is taken from a retrieval phase that combines radiances near the 118-GHz oxygen line, providing temperature from 90 km down to about 16 km, with radiances near the 239-GHz isotopic oxygen line, extending the profile down to about 9 km. Status Flag: Only use profiles for which the Status field is an even number. Precision: Only use values for which the estimated precision is a positive number. Hogan, R.J., A. BOZZO1, "A flexible and efficient radiation scheme for the ECMWF model", Journal of Advances in Modeling Earth Systems, Not yet published. Holmen, S.E., C.M. Hall, M. Tsutsumi, "Neutral atmosphere temperature change at 90 km, 70° N, 19° E, 2003–2014", Atmospheric Chemistry and Physics Discussions 15, 11, 15,289-15,317, doi:10.5194/acpd-15-15289-2015, Not yet published. Lee, C., G. Jee, J. Kim, I. Song, "Meteor echo height ceiling effect and the mesospheric temperature estimation from meteor radar observation", Ann. Geophys. Discuss., 1-16, doi:10.5194/angeo-2018-32, Not yet published. Sakazaki, T., M. Fujiwara, M. Shiotani, "Representation of solar tides in the stratosphere and lowermesosphere in state-of-the-art reanalyses and in satelliteobservations", Atmospheric Chemistry and Physics Discussions, 1-42, doi:10.5194/acp-2017-750, Not yet published. Wing, R., A. Hauchecorne, P. Keckhut, S. Godin-Beekmann, S. Khaykin, E. McCullough, "Lidar temperature series in the middle atmosphere as a reference data set. Part B: Assessment of temperature observations from MLS/Aura and SABER/TIMED satellites", Atmospheric Measurement Techniques Discussions, 1-23, doi:10.5194/amt-2018-139, Not yet published. Harvey, V.L., C. Randall, L. Goncharenko, E. Becker, J. France, "On the Upward Extension of the Polar Vortices Into the Mesosphere", Journal of Geophysical Research: Atmospheres 123, 17, 9171-9191, 10.1029/2018jd028815, 2019. 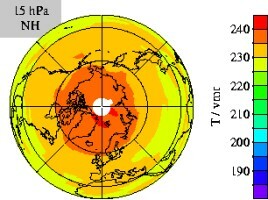 Medvedeva, I., K. Ratovsky, "Effects of the 2016 February minor sudden stratospheric warming on the MLT and ionosphere over Eastern Siberia", Journal of Atmospheric and Solar-Terrestrial Physics, 1-10, doi:10.1016/j.jastp.2017.09.007, 2018. Polichtchouk, I., T.G. Shepherd, R.J. Hogan, P. Bechtold, "Sensitivity of the Brewer-Dobson circulation and polar vortex variability to parametrized nonorographic gravity-wave drag in a high-resolution atmospheric model", Journal of Atmospheric Sciences, doi:10.1175/jas-d-17-0304.1, 2018. Strahan, S.E., L.D. Oman, A.R. Douglass, L. Coy, "Modulation of Antarctic vortex composition by the quasi-biennial oscillation", Geophysical Research Letters 42, 4216–4223, doi:10.1002/2015GL063759, 2015. Vignon, E., D.M. Mitchell, "The stratopause evolution during different types of sudden stratospheric warming event", Climate Dynamics, published online, doi:10.1007/s00382-014-2292-4, 2014. McLandress, C., J.F. Scinocca, T.G. Shepherd, M.C. Reader, G.L. Manney, "Dynamical Control of the Mesosphere by Orographic and Nonorographic Gravity Wave Drag during the Extended Northern Winters of 2006 and 2009", Journal of Atmospheric Sciences 70, 7, 2152-2169, doi:10.1175/JAS-D-12-0297.1, 2013. Yi, M., Y. Fu, P. Liu, Z. Heng, Y. Gao, X. Hong, "Analysis of the variation of atmospheric composition in the upper troposphere during a strong convection in eastern China in summer", Chinese Journal of Atmospheric Sciences 36, 5, doi:10.3878/j.issn.1006-9895.2012.11124, 2012. Klekociuk, A.R., M.B. Tully, S.P. Alexander, R.J. Dargaville, L.L. Deschamps, P.J. Fraser, H.P. Gies, S.I. Henderson, J. Javorniczky, P.B. Krummel, S.V. Petelina, J.D. Shanklin, J.M. Siddaway, K.A. Stone, "The Antarctic ozone hole during 2010", Australian Meteorological and Oceanographic Journal 61, 253-267, 2011.